City Electrical Factors have hosted their first wholesale electrical trade show. The event was held in Hall 9 at the NEC, Birmingham on Friday 19th June 2015. The CEF Live event hosted more than 40 industry leading manufacturers, with product learning seminars by industry experts as well as innovative product launches. This event was a must for electrical contractors; architects; specifiers; public sector bodies and private sector Companies. 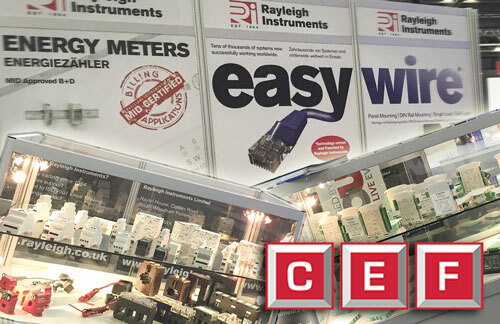 Rayleigh Instruments were delighted to be showing products at this inaugural event including their range of Elster kWh meters, Easywire meters and current transformers, their range of Elko and Datexel products along with Rayleigh energy meters and many of their stocked CT's. We wish this event every success in the future.